This canopy outdoor tent is made with steel construction for a lower cost alternative. This tent is perfect for mild advertisers who need a lighter duty but still want to be found and look great. Canopies are an excellent way to advertise your business while providing cover from the elements at outdoor events. This steel frame canopy tent is a standard 10 ft. x 10 ft. size with five different heights ranging from 10.5 ft. to 11.25 ft. tall, the telescopic legs snap into place easily setting the height. The graphic is printed on special water resistant material with a UV-cured printing process that dries immediately even in the worst rain storms. The printed canopy has shiny vivid colors that POP for a professional look that brings attention to your booth. A handy travel bag is included. Wind Speed Rating: The max wind speed is 20-28 mph. 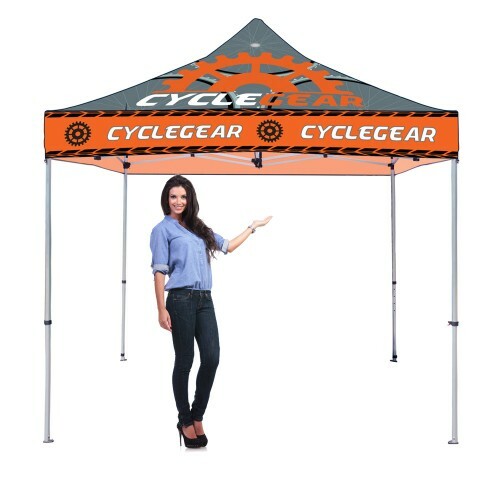 Promote your business while offering protection from the sun, rain or wind with this steel frame canopy tent! Pop-up canopy outdoor tents are portable and quick and easy set up in under 10 minutes!